The WE M92 Airsoft Berreta Gas Blow-back. 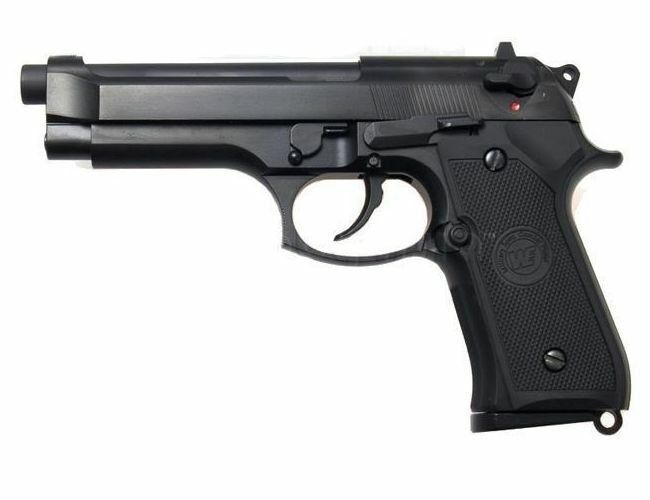 The WE M92 Airsoft Gas Blow-back full size metal Pistol is a single fire weapon. This is a very smooth slide cycling gun and has the clunks of a real gun.The real version Beretta 92 is a semi-automatic side arms made by Bernetta. The M92 first appeared n 1972 and is still in production today. The United States Army replaced the 1911 with the military Beretta M92f. This is a High quality replica M92 Beretta and made from allow metal and non slip handle.The handle grip in knurled for sure grip.It is a blow back with a kick recoil and makes this gun perform like the real steel. it locks out after the last shot so you know the gun is empty.It has an adjustable hop up system and a 25 round magazine.